ENWIN Energy and Tessonics Announce Creation of ONtech Rapid Coatings Inc.
Windsor, ON: ENWIN Energy Ltd. (ENWIN Energy) in partnership with Tessonics, a Windsor-based innovative technology solutions company, announced today the launch of ONtech Rapid Coatings Inc. (ONtech), a new company that offers solutions for the treatment and repair of surface materials, using advanced, customized metallic coatings. 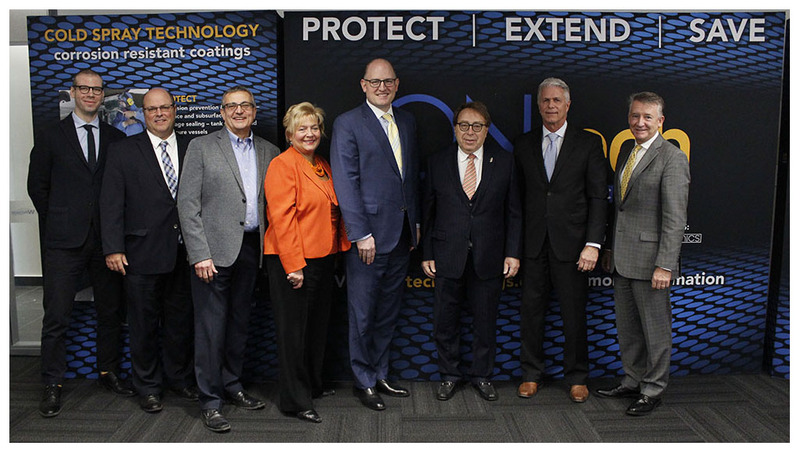 ONtech is the direct result of a research partnership between The ENWIN Group and The University of Windsor’s Institute for Diagnostic Imaging Research (IDIR), supported by a Natural Sciences and Engineering Research Council of Canada (NSERC) grant awarded to IDIR in 2012. Under the NSERC grant, and through cash and in-kind contributions, ENWIN partnered with IDIR, leveraging ENWIN’s utility and operational experience and expertise to discover potential applications for the technology. 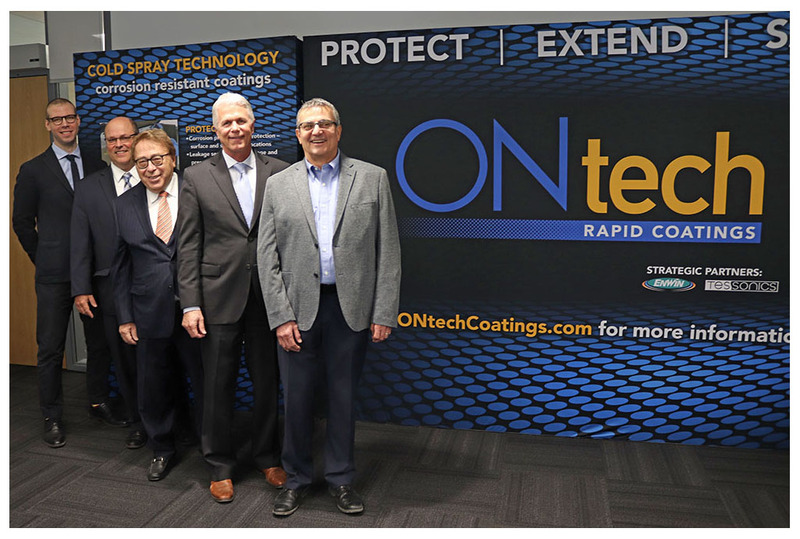 Seeing the business opportunities for this technology, ENWIN’s unregulated subsidiary, ENWIN Energy pursued a partnership with Tessonics, a global leader in ultrasonic technical solutions, to create ONtech Rapid Coatings Inc.
What is Cold Spray Technology? 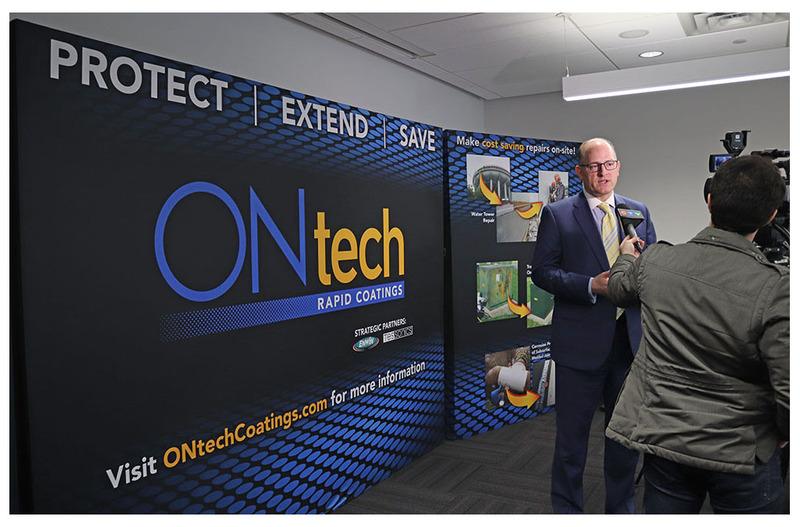 ONtech has developed a cold spray based technology for forming corrosion resistant coatings. The process is called Dual-Flow Cold Spray (DFCS), and can be employed across a variety of applications to stop the spread of corrosion damage and to protect corrosion-prone equipment components, therefore greatly extending the life of the treated assets. The cold spray application is a quick, long-lasting and cost-effective solution which can assure asset life for decades, by preventing or repairing oxidation (rust) on surfaces, and internal and external services and weld joints. Applied to electrical connectors, cold spray reduces contact resistance by almost 50%, minimizing the potential of overheating and line loss, making it ideal for corrosion protection of connectors. How is this technology used? Corrosion affects asset life and can be a potential safety issue. Reduced service life or compromised reliability increases capital costs. ONtech’s DFCS process quickly and efficiently repairs corrosion damage and provides proactive protection to ensure assets reach their full working term and beyond. Applications include electrical distribution assets such as transformers, switching equipment, transformer stations and connectors. The treatment is also ideal for water distribution assets, including pipes, pipe joints and storage facilities, such as water towers. Repairs can be made on site, reducing costs and downtime. In the case of critical, high value transformer stations, cooling fin and oil tank repairs can be made without the need for the station to be de-energized. This offers significant time, resource and cost savings with no customer disruption.